“Women and girls are made to be courageous. We were made to lead the way. 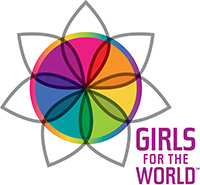 Girls for the World organization is very important all over the world because of the work that Karen made. She helped us to know that we are valuable. “Every circle girls be my friends in workshop. I learn every workshop, every time I learn different things like painting, meditation, exercise. Before program I didn’t talk everybody and I fear talk with new peoples. I don’t answer any people, not participate any program. I have answer but not give in school. I give answer to teacher very scared and my body is vibrate. “I have many years experience in my areas in city. I work with children, women, and youth. Our areas very poor and many peoples are victims. Areas has large number of girls are dropped in school, most of girls working home cleaning. Karen organised first training workshop with girls. I see my dreams start. Girls are first time first day very shy and feel fear for speak. Now all GFTW girls are powerful speaking, dancing and participates all programmes. I happy to see this. Girls are very confident. I do program with Girls for the World and I change. I say truly I am so confident. Now I taking any high post officer, like high court advocate, without any fear. I have so many confidences. Please provide your email address to receive news and updates.